1. The application uses oauth/request_token to obtain a request token from twitter.com. 2. 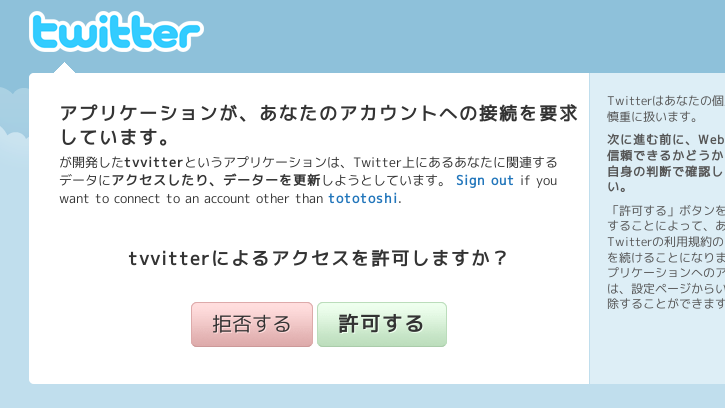 The application directs the user to oauth/authorize on twitter.com. 3. After obtaining approval from the user, a prompt on twitter.com will display a 7 digit PIN. 4. The user is instructed to copy this PIN and return to the appliction. 5. The application will prompt the user to enter the PIN from step 4. 6. The application uses the PIN as the value for the oauth_verifier parameter in a call to oauth/access_token which will verify the PIN and exchange a request_token for an access_token. 7. Twitter will return an access_token for the application to generate subsequent OAuth signatures.